This year for Lucille has been a rainbow unicorn year. Most everything she asks for or wants has some sort of rainbow or unicorn theme. Often together in "rainbow-unicorn" madness. I know other moms know what I'm talking about. So when I asked her what she wanted from Santa - she said "A rainbow unicorn robot." Well after some digging and showing her pictures of the closest things I could find - we landed on this furReal StarLily toy -- which really seems a little creepy to me - but whatever makes her happy. 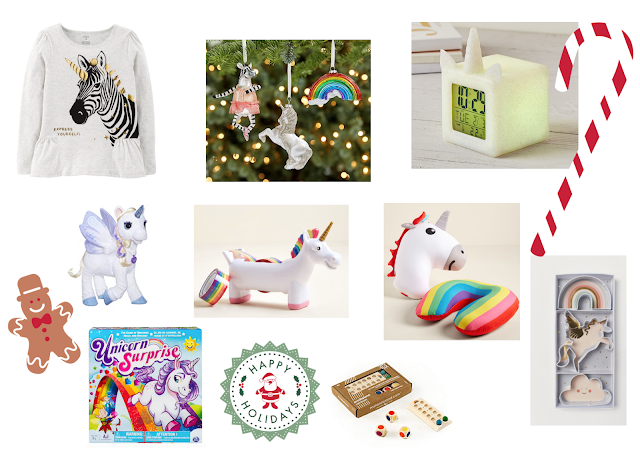 Anyways - I've done lots of rainbow unicorn gift searching -- so I thought I'd share some of the better finds here. Any fun and unique rainbow or unicorn gift ideas that I'm missing? Share in the comments!